Michael L. Walden is a William Neal Reynolds Distinguished Professor and Extension Economist at North Carolina State University and a member of the Graduate Economics faculty with The Poole College of Management. 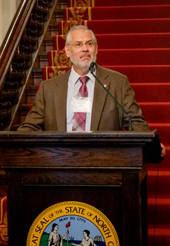 Mike Walden speaking at the North Carolina Governor’s Mansion. His Ph.D. degree is from Cornell University and he has been at N.C. State since 1978. He has also been a Visiting Professor at Duke University. He has served on several local and state level commissions. He currently teaches ARE 201 Introduction to Agricultural and Resource Economics. 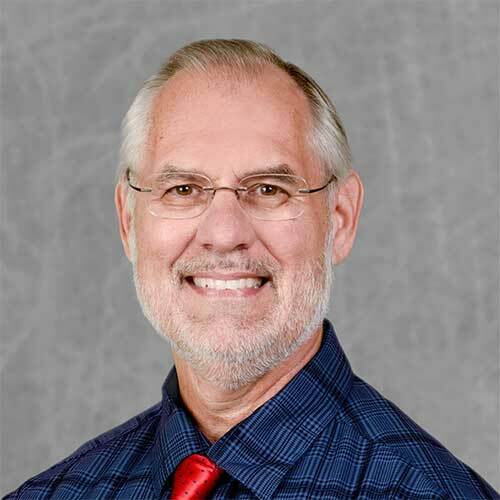 Dr. Walden has teaching, research, and extension responsibilities at NCSU in the areas of consumer economics, economic outlook, and public policy. He has published eleven books and over 300 articles and reports, including the books North Carolina in the Connected Age in 2010 and North Carolina Beyond the Connected Age: The Tar Heel State in 2050 in 2017, both published by the UNC Press. See Michael’s studies and achievements and how they impact the ARE department. How Would Ending NAFTA Impact the North Carolina Economy? With his wife, he is the co-author of three “economic thrillers”, Macro Mayhem, Micro Mischief, and Fiscal Fiasco, designed to teach economics in an entertaining way. Dr. Walden can be frequently seen, heard, and read in the media. He has daily radio programs aired on stations around North Carolina for which he has won two national awards. He is often interviewed on local TV and radio news broadcasts, has appeared on NBC, CBS, The Fox Report, and the Newshour With Jim Lehrer, and is frequently quoted in such newspapers as USA Today, The News and Observer, The Charlotte Observer, The Boston Globe, The Wall Street Journal, and The Washington Post. His biweekly column, You Decide, is carried by over forty newspapers in the state. He has made over 2500 personal presentations. Dr. Walden directs the semiannual economic forecast, The North Carolina Economic Outlook. He has won numerous academic and public awards, including two Champion-Tuck Awards for Excellence in Broadcasting, the UNC Board of Governor’s Award for Excellence in Public Service in 2010, the Order of the Long Leaf Pine in 2013, and the Holladay Medal for Excellence from North Carolina State University in 2014. His newest book, North Carolina Beyond the Connected Age: The Tar Heel State in 2050, was published in late 2017. The University of North Carolina Press, 2017. The University of North Carolina Press, 2008. Journal of Regional Analysis and Policy, Vol. 48, no. 1, pp. 12-22. Journal of Financial Planning and Counseling, Vol. 26, 2015, 160-171. The Review of Regional Studies, Vol. 35, Fall 2005, 231-245. Popular Government, Vol.. 69, Fall 2003, pp. 49-64. The Journal of Consumer Affairs, Vol. 35, No 1. pp 141-161, Summer 2001. Journal of Agricultural and Applied Economics, vol. 31, no. 3, December 1999 pp. 593-609, By Walden, Michael L. and Mark Sisak. The Journal of Consumer Affairs, vol. 32, no.2, Winter 1998, pp. 204-226. Journal of Consumer Affairs, Summer 1990, 24(1): 24-43. Journal of Consumer Affairs, 1988, 22(1).